Trailhead and parking area are on Orris Road in Thornton, NH. Take Upper Mad River Road from Rt. 49, 5.5 miles east of Rt. 93 at Exit 28. In 0.7 miles, turn right onto Orris Road. The parking area is 0.6 miles down, on the right. 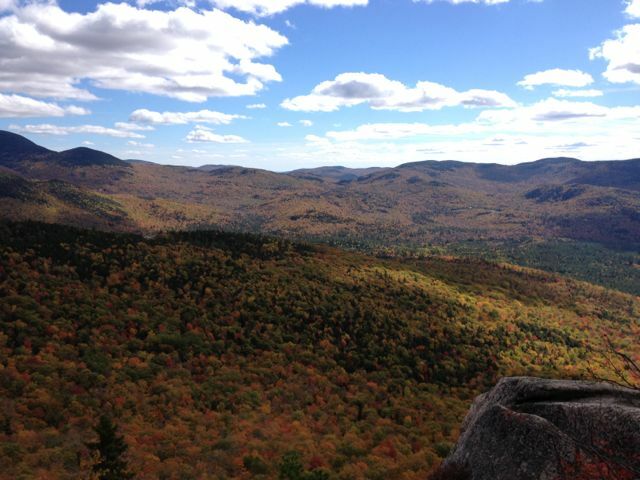 The Welch-Dickey Loop is one of the most popular hiking trails in New Hampshire, and it's easy to see why. Over two miles of hiking over open ledges with spectacular views make it one of the most enjoyable hikes in the White Mountains. Welch and Dickey are actually very small mountains in comparison to those surrounding them. While those higher peaks do block some of Welch-Dickey's endless views, these fabulous little mountains are almost always mentioned in a list of "best reward for effort" hikes. From the parking area, head to the trailhead and immediately bear right onto the Welch branch of the trail. The beginning of the loop is a flat path through the forest, following a brook. It crosses the brook within 0.1 miles of the parking area. After about half a mile, it turns and starts to angle uphill. It gradually climbs up for 0.8 miles before coming to a the first of the open ledges. This is area is known as the Welch Ledges. All along the rock are many kinds of rare plants and mosses, sectioned off by log barriers. At the end is a steep cliff, from which is a very nice view of the Tripyramids and Sandwich Dome. If you look back, you can see the knobby peak of Welch rising above you. From here, the trail continues alternately across the open rock and through the forest. The trail eventually steepens and heads up a wide and very steep rock slab where you can look back and see the Welch Ledges. Views are excellent from here; you can now begin to see into southern New Hampshire. At the top of this ledge, the trail heads back into the forest, leads beside a large boulder, then goes back out into the open. It climbs another rock slab. It then scrambles up through rocks into the forest again and soon passes through a tight rock passageway. The trail soon comes back out onto expansive ledges and makes the final climb to Welch Mountain completely in the open. The summit is reached just over half a mile from the first ledges. The view from the summit is spectacular to the south, east, and west. Some of the view to the north is blocked by nearby Dickey. The view to the south extends far into southern NH. The view to the west reaches into Vermont. The most prominent feature is Mt. Moosilauke, to the northwest. Looming over Mt. Dickey is Mt. Tecumseh, to the northeast. To the east, you can see the Tripyramids. The trail descends the rocky peak of Welch very quickly, passes a large cairn, then enters the forest in between the two mountains. The ascent begins easily, then becomes steeper and rockier through the forest before emerging on more open ledges, from which are good views back at Welch Mountain. The summit is reached in half a mile from Welch. Dickey's summit view is partially restricted by trees. Fortunately, an open rock area nearby has a much better view. To reach this viewpoint, first look to your right as you approach the summit of Dickey. You should see a clearing with a cairn a few hundred yards away. This is where you want to navigate to. Follow a clear path over the rock 0.2 miles to this area. The highlight is a distant view of Franconia Notch. The descent from Dickey is similar to the ascent; the trail leads over large sections of exposed rock with expansive views. In 0.8 miles, you will cross the final ledge, which has good views to the west and back at Welch, as well as an impressive cliff. Past this ledge, the trail goes into the forest for the last time and descends moderately for 1.1 miles. Just before reaching the parking area, turn left to stay on the trail as a bike trail goes right.